Heeey guys, I'm kind of low in the rankings over at TWC (okay, I'm still in the top 50, I'm just being picky lol), so if you could vote for me today, that'd be super cool! And you can see a panel from tomorrow's page for your trouble :). Or part of one. So, a few people were worried at the end of Chapter 6 that this story was over or that we were done with the weird pack in the woods. That would be really anticlimactic! So I figured I should probably make it very clear in the actual story that yes, we've got a lot of things to figure out still! And hey, now we have a very convenient method of finding out some of those answers! Well, not convenient exactly, because HMMM how do you get something a reclusive witch has touched? But it's a method nonetheless. They've already briefly discussed the visions back in Chapter 4, but I thought it might be good to bring that back around again. I kind of hate when stories keep reiterating stuff that didn't happen that long ago (Harry Potter had this a lot..."we just learned this! Why are you telling me again? Oh, these books came out three years apart, so I guess a refresher would be in order..."), but in webcomic time, it's been like a year and a half since I posted chapter 4 O_O. I keep moving Elias around on this page to wherever is most convenient for my composition. Maybe he's restless. Malaya's original line in the third panel was "Balls." instead of "Damn. ", but I decided that "damn" worked better. I say "balls" all the time, but that makes more sense for me than her :D. In other news, I added a button to the right side bar so you can donate through PayPal! 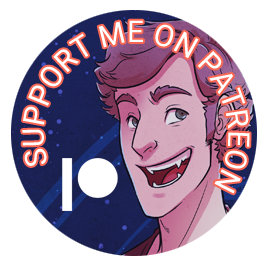 I've had a few people who expressed interest in that, but weren't looking to join Patreon, which I totally get. So, if you'd like to help support this comic (other than turning off your ad blocker for this domain, please! 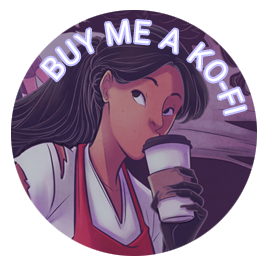 ), you can "buy me a coffee" or whatever :). That's honestly a bit too twee for me, but the logistics of not getting slammed by PayPal for accepting "donations" when you're not a non-profit is a bit hairy, and this third party site operates as a middle man. So, if PayPal tries to screw me, I can blame someone else instead of myself. Yay! And the button is cute, so that's nice. 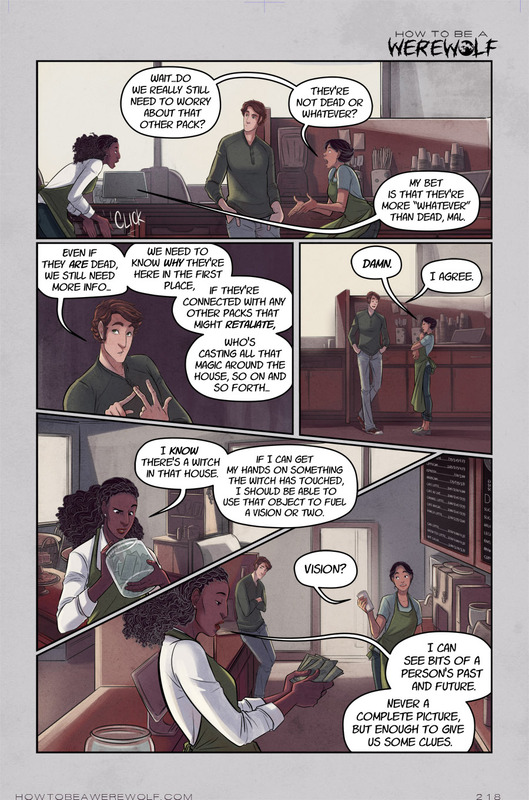 I spent yesterday coloring the backgrounds for this page while going back and forth between watching Forensic Files and The Great British Baking Show on Netflix. Um...Cake or death?